In Faith, in Doubt, in Love All Over! The issues are discussed clearly and in detail, with support from expert opinions, survey results, and a delightful profusion of personal stories from couples with a wide variety of backgrounds. Not all of the stories end in happily-ever-after – this isn’t a rose-coloured view of only the positives. And yet, I came away from the book with a warm feeling of hope for humanity. It’s a well-rounded view of the ups and the downs that avoids all of the hyperbole and polarization that has characterized much of the religious/non-religious dialogue in popular media and books lately (and, to be fair, throughout history). I was a little surprised to be invited to read an advance digital copy for preparing this review. After all, as a secular humanist married to a secular humanist I’m not exactly in the target demographic. But it turns out that Dale has a lot to say that I ought to keep in mind, both in my own marriage, and in my relationships with other people. Why in my own marriage? Well, no matter how closely two people identify with the same worldview, there will be some points they disagree on. For example, I consider myself a regrettably-lapsed vegetarian, while Deena is far more comfortable with the omnivorous lifestyle. Also, Dale talks specifically about how some people seem to have more appetite for community than others. In the book, this is offered as an explanation why some people are more drawn to religion than others. But even if you hold the same beliefs and identity, such differences of personality could cause tension if left unrecognized. What other relationships could benefit from the advice in this book? Most of them, I expect. There’s a chapter titled “Communication and Respect”, where Dale walks through some of the ways we can keep communication open and honest, maintaining respect for the person even in the face of deep disagreements over beliefs. I have religious relatives whose company I greatly value, but who I have felt uncomfortable opening up to for fear of inadvertently kicking up a hornet’s nest. With the tools Dale offers, I now feel safer connecting with those people, discussing important things. 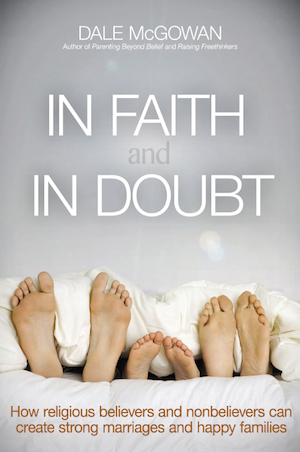 This book also has a lot to say to concerned friends and family of mixed-belief couples. These are people who can have a strong influence – for good or for bad – on a couple’s happiness. When they know what is really likely to be in store, these loved ones can make their influence as positive as possible. I don’t know how many people enter relationships, only to discover a difference in beliefs and back out – fearful that the difference is just too big to overcome. Those stats don’t come out in any of the surveys Dale talks about – I don’t know how you could even get those stats. Anyway, if you’re in a new relationship with someone who identifies differently from you, reading this book may give you a more hopeful perspective on what may lie ahead. So, to sum up, if you are or may ever be in a relationship with someone (romantic, familial, collegial, or otherwise) where differences of belief may be involved, I think this book will serve you well in navigating those differences. You will get descriptions of religious and non-religious people (based on real data, not caricatures), and overviews of different approaches to weddings between religious and non-religious people, how to deal with church attendance and other religious practices, issues of communication and identity, managing in-laws with strong opinions on religion, having children, and even navigating divorce (which happens – though at no greater rate than in other marriages). Check it out. I bet you’ll learn something! This entry was posted on 2014/08/06 at 18:00 and is filed under review. You can follow any responses to this entry through the RSS 2.0 feed. You can leave a response, or trackback from your own site.